Downtown Camrose is your Shopping & Entertainment Destination! You’re invited to visit the historical downtown district of Camrose. The historic buildings house unique boutiques and specialty retailers that oﬀer everything from clothing stores for all ages, to home décor, furniture, antiques, crafts stores and specialty dining. You won’t be disappointed! 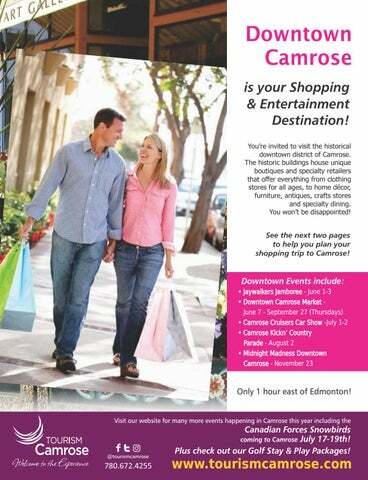 See the next two pages to help you plan your shopping trip to Camrose! Only 1 hour east of Edmonton! Canadian Forces Snowbirds coming to Camrose July 17-19th! Plus check out our Golf Stay & Play Packages!